It’s simple…You pick a date and venue, and we’ll arrange the comedian(s) based on your needs. Our performers can do a funny show with material ranging from a G to PG-13 rating. Your organization sells tickets for the event. 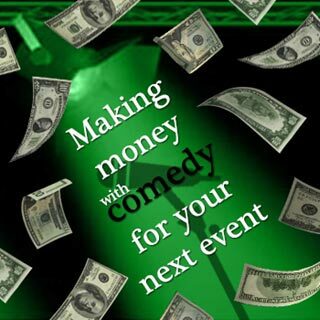 Our comedians can even help you promote additional money-making activities that night such as 50/50 raffles, Chinese auctions, etc..
• A professional comedy performance tailored to your needs (featuring anywhere from 2-3 performers) that will make your guests laugh! • Professional sound and lights to ensure a quality show. • Step-by-step assistance – such as showing you how to set the room, develop promotional materials and use social media to boost ticket sales. Your organization will be laughing all the way to the bank!! !